Welcome to the Meridian Hive family, we are excited to have you as our partners and want to do what we can to help make our partnership successful! Below you will find many items of POS print material. Please feel free to download and print them as you need them. 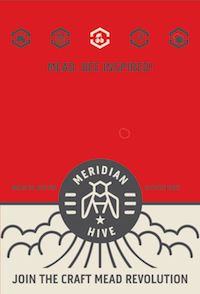 NOTE: if you do need to make changes to these files, for example to customise them for your state/city, then please send your customized artwork to 'marketing@meridianhive.com' for approval. 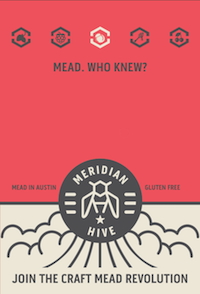 If you would like help in customizing files please reach out, we would love to help, 'marketing@meridianhive.com'. Product information sheets, are US Letter size 8.5” x 11” . They are great leave behinds and handouts at events. Table tents are 'A Frame' table top decorations. They are great to have on tables & bars at promo's, pint nights. Shelf talkers are great additions to any retailers display. They are small, concise and packed with info. Banners are Vertical 2'x3' or Horizontal 3'x8'. They are great for in store demo's or festivals. Great for giveaways, as prizes and POS material. Product information sheets contain the latest product range and availability. NO PRICES. This is a great leave behind for customers. NOTE: this file is compressed for fast download, online display.